Terroir One, the Mumbai Chapter of the Delhi Wine Club which held the inaugural dinner a year ago at JW Marriott Hotel, was back for the first event of this year with Fratelli Wines, a collaborative effort of three brother-duos who charmed the members with their Indian wines of the very first vintage, writes Subhash Arora, chairman of the Chapter who attended the anniversary event. A week earlier at a lunch in Delhi, Arora had the opportunity of tasting the white Sauvignon Blanc and the red Cabernet Sauvignon from Fratelli Wines, owned by the Indo-Italian brother-duo of Alessio and Andrea Secci from Tuscany, Kapil and Gaurav Sekhri from Delhi and Ranjit and Arjun Mohite-Patil from Maharashtra. 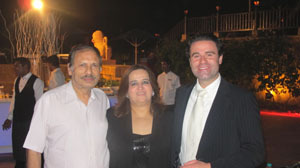 He met Gaurav Sekhri and their father who asked him his opinion about Fratelli wines. His only comment was whether it was really the wine from their own tanks and vinified by them? They confirmed it instantly and Alessio was even mildly offended when Arora put the same question to him at JW Marriott on Sunday evening at the salt water lake pool venue, for even thinking it would not be completely and genuinely their own production. Alessio may not be well aware yet that in India such a possibility is a distinct reality in the absence of proper wine laws. Thanks to Faiek Saadani, the dynamic F & B Director of JW Marriott, the setting was perfect and the Menu for the evening was simply mouth watering. Deviating from the usual DWC theme of a 5-course sit down dinner with 5 paired wines, all the three wines produced by Fratelli wines were presented. Sauvignon Blanc, Chenin Blanc and Cabernet Sauvignon-2010 all, were served with food at several live stations, for members to taste and eat at their own pace and enjoy pairing food with wine, and share their experience of the first year and the thirteen club events which the President, Bindu Malhotra, had deftly organised last year, despite promising 8-9 events only. Emulating the policy of the parent Delhi Wine Club, the executive committee had decided not to renew membership of a few members who vociferously missed liquor at the dinners. It was also an occasion to welcome a few enthusiastic new members who are already wine lovers and are keen to learn more.. 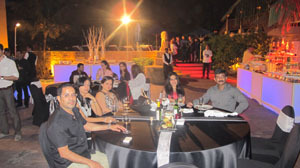 The celebrity Vice- President of the Club, Prahlad Kakkar, who has been a very active supporter of the club with several useful inputs, had a couple of words of advice as he admitted thinking that the wines were so delicious they tasted like imported wines. He advised the members not to drive home themselves after the amount of wine they would be tempted to drink this evening. The best characteristic of a decent quaffable wine makes one want to have another glass the moment the first one finishes, followed by the desire to have yet another. All three wines passed this basic test. They were also very clean, fresh and flavourful wines with persistent taste and fairly long finish. The Chenin had a rather unique character, in that it was dry and slightly citrus. The Sauvignon was full of typicity with a touch of tropical fruits but with vegetal, grassy and asparagus flavour. The Cabernet was not really a suitable match with a majority of the dishes due to the strong tannins but had the typical berry flavours and enough acidic backbone, making it juicy on the palate. However, it was heavenly with Haleem that Kakkar, as a gourmet of Indian cuisine, found to be one of the most delicious preparations. Sonam Holland, wine educator from Mumbai, was at hand to present the wines as Alessio talked about the winery and the project, being spearheaded by the well-known Tuscan winemaker, Piero Masi who had regretted to attend the dinner as he was busy minding the tanks at the winery where the current vintage is under vinification. Even Alessio came for a day especially for the event to meet and taste with the members of Terroir One, and was planning to return to the winery in Akluj, about 160 km from Pune, next morning. 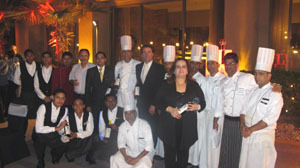 A group of visiting Italians who were staying at the hotel chanced to walk past the dinner venue and were invited to join for a taste of the wines. All of them were very impressed with the wines too and could not believe they were Indian-made wines. What was equally notable was the preparation of the food and its quality. Marriott has already perfected the art of presentation and excellent service-including the wine service with the sommelier already quite familiar with the wines. It is a pity the wines are not available in Delhi yet though this year the company is coming out with a dozen new varietals including Mueller Thurgau, Gewurztraminer, Petit Verdot, Chardonnay and Sangiovese and with enough quantity to feed the Delhi market. Fratelli Wines are already available in Mumbai and Pune at Rs. 650 for the Cabernet Sauvignon, Rs.595 for the Sauvignon Blanc while the Chenin Blanc has been priced at more competitive price of Rs.495. Half-bottles (375mL) have been priced at Rs.335, Rs. 315 and Rs. 260 respectively, said Rajiv Bali, the national marketing head who has his work cut out for him for the next few years. Meanwhile, if the fratelli of Fratelli Wines remain as committed and dedicated as they are now and play their cards right in terms of quality, price production and penetrating the market, oh brother!-they will pose a major threat to the existing wine producers of Maharashtra in the medium to long term and will become a significant domestic player!